Nicolette Chamard, a woman of color in the most color-conscious city in the world, rejoices when the Union Army marches into New Orleans. At last her people will be free, and even knowing her collaboration with the Union will put her in danger, she means to help make it happen. Marcel Chamard, Nicolette's privileged white half-brother, surveys the same parade and sees conquerors, not liberators. If the Union wins the war, it will mean the end of the slave-holding culture, the end of wealth and ease. 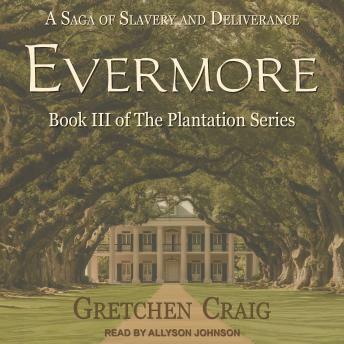 Marcel wants nothing to change, not the family's rich cane plantation, not the life he plans with his lovely white bride, and not the life he lives with his beloved colored mistress and their two sons. Finnian McKee, a Union Army officer, comes from a family of abolitionists. He is determined to do his small part to make the ideal of freedom a reality for all. When he meets the fascinating Nicolette Chamard, he is too new to New Orleans to recognize that though she is light-skinned, she is by Louisiana standards a Negress. Torn apart by the war and by a culture that forbids their union, his heart's desire is to find love with this woman that will transcend the bonds of race.